Fiji has re-joined the PACER Plus negotiations on its terms as an equal partner and a party committed to regional integration and development. 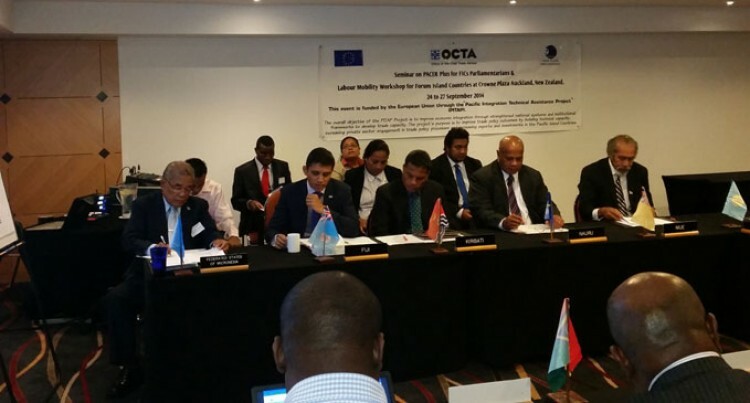 Fiji’s participation at the PACER Plus meeting which began in Auckland yesterday was the first after a lapse of over five years. The Pacific Island Forum had decided to exclude Fiji from PACER Plus meetings, and in response, the Fijian Government had fully withdrawn from the PACER Plus negotiations, as a matter of principle. In these negotiations Fiji is demanding tangible and binding commitments from Australia and New Zealand in the PACER Plus Agreement. This is in return for opening up the Pacific Island countries markets to the two nations. Permanent Secretary for Industry and Trade, Shaheen Ali, made these comments after delivering a statement on behalf of the Fijian Government and the Minister for Trade, at the high level Ministerial meeting on PACER Plus in New Zealand. “Fiji’s involvement will add credibility but will also give the much-needed leadership. Australia and New Zealand value our involvement because they value our market,” Mr Ali said. The PACER Plus Agreement is expected to offer the regional countries, as well as Fiji, better market access not only in terms of tariffs but also rules of origin, quarantine and trade facilitation. Mr Ali further reiterated the importance of PACER Plus to regional trade and economic integration. “We should not see PACER Plus as a traditional agreement between the PICs and Australia and New Zealand,” he said. “Rather, PACER Plus should be a means to deepen regional integration, create opportunities for growth, create a strong regional economic bloc and ultimately lead to meaningful socio-economic development of our respective countries. At sub-regional level, Mr Ali said the Melanesian Spearhed Group (MSG ) Trade Agreement is already acting as a building bloc towards a wider Pacific integration. “It has been very successful in creating trade amongst the MSG countries and is now leading to the dawn of a new era of customs unions and the harmonisation of customs and biosecurity rules,” he said. Mr Ali said it was evident that PACER Plus negotiations in the past few years had progressed in Fiji’s absence and some areas/chapters had been concluded. But he assured delegates that Fiji joined the talks with an open mind and with an intention to engage in good faith, and certainly did not want to hold the process back. “Therefore, we ask that certain special considerations be extended to us in order to facilitate our smooth re-entry into the negotiations,” he said. Mr Ali said PACER Plus requires extensive national consultation and there requested the assistance of the Office of the Chief Trade Adviser in conducting specialised consultations in Fiji. “And at the same time allow us to obtain the necessary approvals where required,” he said. Mr Ali stressed Fiji believes that, as a group we need to focus our discussions on key areas such as trade in goods, labour mobility and development cooperation. “These should form key sections of the agreement,” he said. “We would also like to see that flexible and a renewed approach taken with regards to chapters on investment and trade in services, with the unique circumstance and needs of PICs taken into account. “These different chapters should not hold progress in the conclusion of the main PACER Plus agreement.